It has officially been one month since Cian and I set off on our worldschooling adventure for 2nd grade. This first month is not very representative of how our year will go since we were crisscrossing the globe with pre-booked trips. It’s been a busy month moving from one time zone and climate to another each week with little down time to recover. But it was fun! For you, me and posterity, here is a recap of how our month shaped up. Are You Following Our Journey? In general the travel portion of our month has been great. In the past 4 weeks, we have spent a week in Ireland, Iceland, Wisconsin and Turks and Caicos. There were definitely ups and downs and almost missed flights, but ultimately it all worked out well. The first week in Ireland visiting family and friends was perfect. Our homeschool routine worked well with an hour every morning dedicated to writing, math and spelling. The rest of the day was spent doing random things like going to the park, going for a hike, etc. It was exactly what I would love for our year to look like. It also helped that Paul was with us and that we were staying with family. Cian discovered the Irish sport of Hurling so he spent his every waking moment practicing. It was a great way for him and his dad to connect with his Irish heritage as well as just get out all of that crazy boy energy. My long time friend Stacie who I know from India flew over to Ireland for one night to hang with us and her brother which was amazing. I had SO much fun being with her again. These are the friends that just fill your bucket. We hiked along the cliffs in Greystone for the day, just enjoying life while catching up. It was perfect. Stacie June came to visit in Ireland! Then we headed down to Kelly’s Resort which is where our family gatherings always are set. It was a fun weekend of letting the cousins run wild together. Cian had fun being more independent at the hotel where he could run around from the pool to mini golf and back again. I also took advantage of the family being there to take a little down time in the room when I could. It was just a little cold in Iceland! After a great week in Ireland, Paul left and Cian and I headed to Iceland. 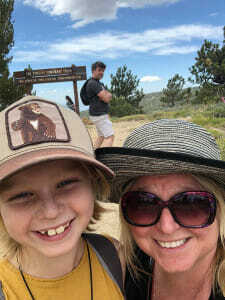 Our relaxed, perfect homeschool routine was thrown out the window with long busy days with little time for school work. With limited time in Iceland we had so much we wanted to see that we let the schooling go by the wayside. We also were moving hotels every day which made it harder to get into a routine. 2.5 mile hike each way in blistering wind to this plane crash – Cian says it was his favorite thing we did in Iceland. Iceland was amazing and is terribly expensive. We loved it though. We were up at the crack of dawn every day and moved all day long until the sun set. One day we hiked over 10 miles. Cian wracked up 30,000 steps on his fitbit on that one day! We cooked Icelandic Rye bread in lava sand, saw so many waterfalls, explored geysirs, soaked in hot springs, checked out a cool crashed plane on a black sand beach, learned about sneaker waves, rode horses in the snow and more. It was magical. Cian said he wants to go for 2 weeks next time! I am not sure our budget will allow that.. but perhaps. Cian is putting together little video reports for his class – Iceland is the first one we have started work on. The only thing missing from our sightseeing list in Iceland was the Northern Lights. We tried every night, but just couldn’t stay up all night searching. We will try again next time. As I told Cian if we mark everything off our bucket list we won’t have a reason to return! Returning home for only 2.5 days meant we had time to unpack, do laundry and decorate the house for Halloween! Priorities people. Our next stop was to Wisconsin for a press trip. This meant that I had an itinerary and had deliverables. Even so, we were able to stick to a basic school schedule of doing work in the morning and adventuring for the rest of the day. Wisconsin was a total surprise and turned out to be an amazing homeschooling state. We visited a dairy farm where we learned all about milking cows and the process that happens after the milk is out. We were also lucky enough to be in town for their Science Festival which meant that science related events were happening all weekend. Cian loved learning about the science of popcorn, weaving and attending a science show. A cold front came in during our visit so we got to experience a cool fall visit to a pumpkin patch (where pumpkins are $2-5!!). We loved all the super American food like tater tots in my breakfast burrito and mains of mac and cheese! I loved being back in a college town and having the opportunity to share with Cian more about my college days and what college life is like. He was super into it all and hearing about all the different types of degrees people were studying for. One lady we met is getting her Ph.D in corn breeding, another was a professor in weaving and one young student we met was studying environmental sociology! Turks and Caicos was our final week of travel for the month and it was amazing! We were there to attend a conference – Social Media on the Sand which is a group of mom bloggers from all genres coming together to be inspired by other entrepreneurs. It was a super fun week. Cian overcame his hatred of kid’s clubs and spent a good deal of time at the resort’s kids club since I was busy with my conference. He went sailing, did science experiments on the beach, played volleyball and soccer and so much more. He knew all the kids all over the resort by the end. It was a great way for him to connect with other kids and for me to get some adult time. Facing my fears and getting IN a photo! We got into a pretty good routine here…but it did not involve school work unfortunately! Up early for breakfast (his now #2 best oatmeal in the world behind the Belmond in Brazil), he would go to kids club and I would go to my conference. Then, every night we would attend a show that included acrobatics. I’m pretty sure Cian is now found a new hobby to aspire to! When I had free time, we spent some time snorkeling and enjoying the water park. Cian typically isn’t a huge water fan, but he overcame some fears and found a love of the water slide! He still wouldn’t go down the larger ones, but progress was made. I even got over my fears and headed down the water slides a few times. Getting over his fears and going down a water slide! The biggest negative of the trip was that Cian was stung by fire coral on one of our snorkeling excursions. I had him hold on to a rope/buoy because we had swam way out into the ocean and it was a bit rough. Big mistake. DO NOT HOLD ON TO ROPES IN THE WATER! Apparently it’s a known no no to not hold on to the ropes in water as fire coral grows on it. I was wearing long sleeves so I didn’t get stung, but he got stung on both arms. Poor guy was so brave though. He just popped up and said he was stung and we had to go back to shore. I was like “Are you sure? We just saw a sea turtle!! !” But nope, we had to go back. We had about a 7 minute swim back to shore and then a 20 minute walk back to the hotel to drop off our snorkel gear. He didn’t cry the entire time, so I really had no idea how bad it hurt. He says it hurt A LOT. We found our way to the resort doc who cleaned him up with vinegar and slathered burn cream on his arm and gave him some Benadryl which started to help. It did not stop him though. He carried on the entire night at our crazy fun Mad Hatter Party. Turns out fire coral is not coral at all, but more closely related to jellyfish. Ouch! Luckily he knew exactly what got him because another kid in camp had also gotten stung by it. Now he sort of wears it as a badge of honor. He said he kind of hopes it scars just so he will always remember. Scar or no scar, I’m pretty sure he won’t forget this memory for a while! It was sad to end our week at Turks and Caicos. We both LOVED it and really enjoyed the totally different type of trip than we are used to. I highly recommend checking out Beaches Resort in the Turks. It’s pretty magical. With an 8 hour layover in Miami, there was only one thing to do… rent a car and head out to explore! We hadn’t made up our minds whether we would leave the airport because the forecast was calling for rain, so we wanted to see how the weather was looking. It was clear, so while waiting for our bags I hopped on Priceline and booked a super cheap car for $17. It was cheap for a reason. We had to take a train to the car rental center where they DO NOT have an office. Instead we then had to then take a bus 15 minutes to their offices to then wait in a LONG line to rent our car. Watching the minutes tick away was stressful since we knew we wanted to make it down to the Everglades which was an hour away. We made it. Even though it felt like time was standing still and everything was going wrong (wrong turns, no food, bathroom breaks), we finally made it and loved it. We saw an alligator, herons, egrets, big mouth bass and more. After a week in a resort it was so nice to be out in nature again, hiking, searching for animals and just being. I really realized that is our happy place. It’s why we loved Iceland so much. Our days there were spent just walking around, exploring. That is exactly what we love doing. After an awesome few hours, we had to rush back as it was getting close to rush hour. I felt super rushed, but we made it and Cian got his 26th park ranger badge! We will have to visit again to do the park justice. On the homeschool front I simultaneously feel like we are doing too much and too little! As far as checking off the boxes, we are doing plenty. Plenty of math, writing and a decent amount of reading. In terms of what he would be doing at Waverly he’s probably way ahead of where they are, but in public school terms I feel like we are just barely meeting their needs. We met with his homeschool advisor who said we seem to be doing fine. She said we don’t even need to worry too much about the math since he seems to be doing well there and to focus more on reading and writing each day. We slacked on his journal writing in Iceland so we will get back to that in Central America as well as making sure we read every single day. It is tough to fit it all in each day, but that is why I actually enjoy having the official homeschool network to support and encourage me to get stuff done! While I have no doubt he is learning so much, I do worry that he’s not getting the varied experience he needs in reinforcing the work we are doing. That is my goal for the next month. We have experienced some fun worldschooling topics like exploring a dairy farm, learning more about the changing of colors on the leaves, plate tectonics and lava, erosion and weathering, and who knows what else! We are definitely not slacking on the science topics. For the other subjects he is using the same materials that his school uses for the most part.. he just has a not so qualified teacher! At the beginning of the month I would have said this was tough. Now at the end of the month, we are in a groove and things are working well. During the first few weeks I found myself more frustrated with Cian than normal. I had to continually remind myself he’s just a kid. He acts so grown up so often than when he reverts to being a picky bratty 8 year old I lose my mind. I became more conscious of that and also recognizing that I get less patient when I am feeling under work pressure. It is a continual process we are working on. He has been struggling with the food. This is his issue to work on. He is such a particular eater that it’s often difficult to manage eating out on the road. He much prefers home cooked food, but even that is very specific. – salmon, fish, grilled chicken with uncooked veggies. Even at home I’ve been struggling with what to cook him, so on the road it’s been more difficult. He has agreed to keep trying new things and not moan too much about what he doesn’t like. And honestly he doesn’t moan, but I know when he doesn’t like something and then I feel bad that he’s not getting enough food. I’m more than fine to skip a few meals for myself but he needs to eat all his meals every day. I am curious to see how things will go in Central America. He says he will be fine to eat beans and rice every day! Let’s hope so! One fun thing has been that Cian has gotten even more into photography. He has taken to using my camera to capture photos of me and to play around with settings. I think I will give him my old Sony mirrorless so he can really get creative with the settings. It’s fun to see where this goes. His bag was about 12 lbs on our first trial run, which he felt was a bit heavy. We will try to get it down a bit more by not taking crazy things like his perplexus! It’s been tough to manage booking our next trips while on the road. I have so little time to get stuff done that I’ve been trying to work on blog posts instead of researching places online. But we are slowly piecing it all together. I really wish I had planned this for an entire year in advance instead of at the last minute.. but such is life! Looking back, I can see how things have changed. I was feeling very moany at the start of the month, but now that we have finished it off with a bang in the Turks and Caicos, I feel more relaxed. However, this month was challenging and made me wonder several times if I can really do this.. and if I really want to do this! Some days the reward of travel does not outweigh the daily struggle that is raising a child and traveling full time. Now we are home for a few days so that Cian can get his full experience of Halloween, one of his favorite holidays of the year. There won’t be too many more years where Halloween really is important for him, so that is why we made the sacrifice to come back home. And he is SO excited. We have managed to fit in most of his favorite Halloween activities already and he is working hard on his DIY Iceland themed costume. He is going to be Fred Tulipop which is a character from an Icelandic cartoon. He got his first stuffed animal of Fred 2 years ago on our first trip to Iceland and has loved him ever since. After Halloween, we pack up and head off to Guatemala. We have rented an apartment in Antigua for a week so that Cian can go to Spanish classes. We will do something on the weekends and then we have an apartment in San Pedro on Lake Atitlan for another week of classes. We are going from our (comped) $1000 a night hotel in the Turks to $150 for a WEEK in Guatemala! I am so excited to get back to Guatemala. It was my first real developing country that I visited. It’s been 16 years since my visit as well. I can’t even imagine how much it has changed. Are you following us on social media? If you aren’t on Instagram, get on it! I update our Instagram Stories daily. For new users, to get to stories, click on my profile photo. When it has a red ring around it, it means I have a new story that you have not seen. Make a habit of checking every morning or every evening as the stories disappear after 24 hours. I have some of our adventures on my highlight reel, but not all of them. Also, Cian has his own Instagram Account, but mostly it’s me posting photos of him in places that I can’t put on my other account. Follow him here. I am trying to do daily/weekly recaps on Facebook as well, but I do not always have the time, so if you want to stay up to date, Instagram Stories is the best. Let us know what you would like to see more of. Do you want to know more about our day to day activities? Our homeschool work? Where we are staying? Budgets? Let me know and I will share it all.